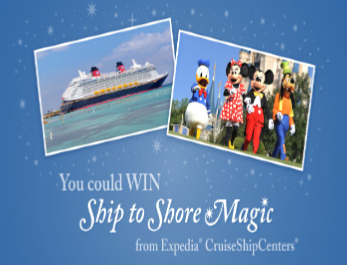 Expedia CruiseShipCenters “Dream Come True Vacation” Sweepstakes – Win a Disney Cruise & more! Win a Disney Cruise & more! ENTER SWEEPSTAKES HERE – Expedia Sweepstakes page. ENTRY LIMIT – there is a limit of one (1) entry per person. ELIGIBILITY – The CruiseShipCenters International Inc. “Dream Come True Vacation” Sweepstakes (“Sweepstakes”) is open only to legal residents of the United States (including Puerto Rico) and Canada (including Quebec) who are at least twenty one (21) years old or older at the time of entry and who otherwise meet the requirements. SWEEPSTAKES ENTRY PERIOD – The Sweepstakes begins at 9:00 am PST on Wednesday, January 2, 2019 and ends at 11:59 pm PST on Thursday, February 28, 2019. One (1) standard room at a Walt Disney World Resort hotel (location/category at the discretion of Disney Cruise Line). Maximum occupancy of four (4) people for three (3) consecutive nights prior to the Disney Dream departure; Four (4) 3-Day Walt Disney World Theme Park Tickets with Park Hopper Option; and One (1) Disney Gift Card in the amount of six hundred U.S. dollars ($600.00). Taxes, Fees and Port Expenses (as defined on the Disney Cruise Line website); and Onboard gratuities for winner and three (3) guests (for stateroom host/hostess, dining room server, assistant server, and head server). The estimated retail value of the Vacation Package is USD$15,345.36 which includes Taxes, Fees and Port Expenses (as defined on the Disney Cruise Line website). Actual final retail value of Vacation Package may be higher or lower based on departure. Vacation Package elements may be subject to additional restrictions. Winner and all guests must travel together on specified itinerary. All travel dates and arrangements are subject to change based on availability and providers approval. Any portion of a prize not accepted by winner will be forfeited. WINNER’S LIST – To request a winners list, send a self-addressed, stamped envelope to CruiseShipCenters International, Inc., #900 – 1066 West Hastings Street, Vancouver, B.C., Canada V6E 3X1. Requests must be received within four (4) weeks of the end of the Entry Period.